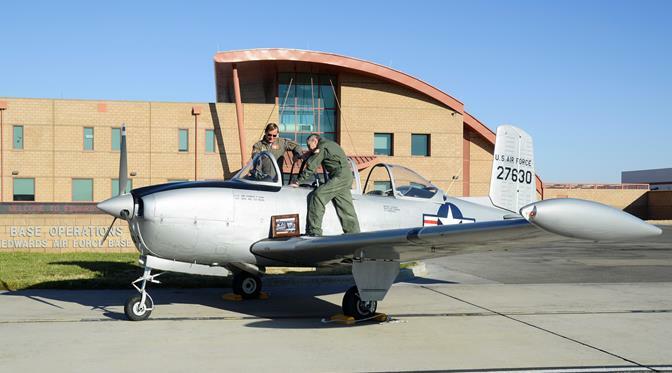 EDWARDS AFB – An original production Beechcraft T-34 “Mentor” returned to Edwards Oct. 17 for a one-day visit 60 years after it was delivered to Edwards AFB for the T-34 flight test program. The G-11 model was one of three T-34’s that came to Edwards in Oct. 1953 for acceptance testing. After the acceptance testing program was completed the T-34 served in the Air Force Training Command at Marana AFB, Ariz., Hondo AFB, Texas, and Spence AFB, Ga. In 1957, it was sent to Tinker AFB, Okla., where it was “loaned” from the Air Force to the Tinker Aero Club with a civilian registration number. The following year it was removed from the Air Force’s inventory and moved to the Civil Air Patrol in Okla., and in 1975 it was obtained by its first civilian owner. Thirty years ago, Talbot “fell in love” with the T-34 and went searching for one of his own. When he found the T-34 it had a “run out” engine and was parked in the back corner of Parks Industries, a major T-34 restoration company in Amarillo, Texas. For the next six years Talbot’s T-34 underwent complete restoration as funds were available. After the restoration process began, Talbot visited Edwards for an open airshow. At that time he found a photograph of an aircraft that intrigued him in the Pancho Barnes room at Club Muroc. He set his mind to discovering what airplane was in the photograph and found that it was his T-34, the very model that was being restored at Parks Industries. Today, the aircraft, fully restored, is owned by Walt Woltosz, CEO of Simulations Plus. His goal was to purchase an airplane that he could learn to do aerobatics in. During their visit to Edwards, Talbot and Woltosz re-enacted the photograph shown at Club Muroc. “I located the original T-34 test report at the Edwards History Office. Reading through the report, I felt a close connection to the captain who was assigned the T-34 program. 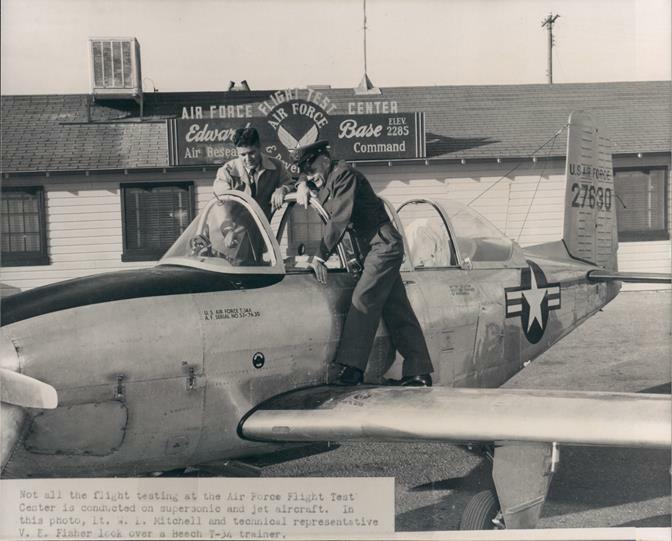 Sixty years ago, this test pilot and his team went out and evaluated the airplane as a primary trainer. He flew the same basic performance and handling qualities test points that we still teach students at the USAF Test Pilot School today. Of course, back then they plotted all the data by hand on graph paper, but the principles are all still the same as we teach in the school house today,” said Lt. Col. Sean Borror, USAF Test Pilot School deputy commandant. Both Talbot and Waltosz have had connections to Edwards during their professional careers. Waltosz joined the Air Force when he was 17 years old and flew B-52’s as an in-flight technician for hound dog missiles. He went on to earn his masters degree in aerospace engineering and work for the shuttle program in 1971 at the Air Force Rocket Propulsion Lab. Talbot began his professional life as a partner in the second largest law firm in Orange County. Eventually Talbot ran the parent company working on aerospace development projects and several shuttle replacement programs. When Waltosz purchased his T-34 from Talbot in June, he gained more than just an airplane, he gained a friend. “As much as I have loved and enjoyed that airplane [Waltosz] was the one person in the world that should have gotten it from me and he did,” said Talbot.